Everybody’s favourite rude cartoon family are back in action, and this time in the online casino world. The Family Guy slot machine is based on the love it or hate it cartoon of the same name, and it is going to take the casino world by storm. This IGT developed slot’s 5 reel and 30 line structure is positively brimming with authenticity. 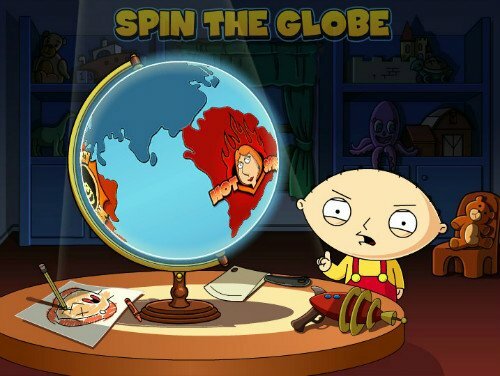 Let’s find out more in our Family Guy slot review. The Family Guy slot graphics are completely faithful to the television show, and are drawn in the same manner. Symbols include Brian, Stewie, Meg, Lois, and of course, Peter, as well as beer, televisions, and ray guns galore. It isn’t all about guns, though, there’s more to Family Guy than that. IGT have done a stellar job with this game, making it enjoyable even to players who aren’t necessarily fans of the show. Before you can win on the Family Guy slot, you will need to place your bets. Players can choose coin values which range from as little as 1p up to £50 in all. You cannot adjust the number of lines in the game (which are fixed at 30), and are going to have to wager an extra 20 coins for the features, meaning 50 coins per spin in all. At its cheapest then, the Family Guy game will cost you 50p a spin, whilst at its more expensive you can expect to be wagering a devastating £2,500 a spin. 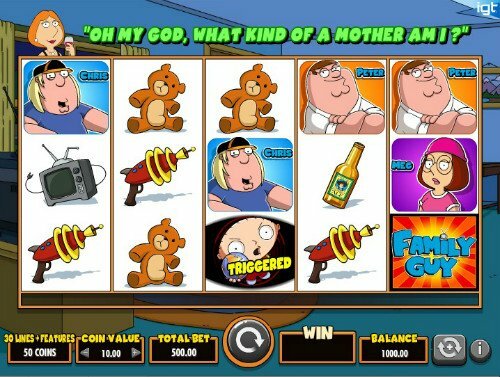 There is a host of features in the Family Game game, including randomly triggered Family Guy bonuses. The wild symbol appears as the Family Guy logo and can substitute for all symbols, save for the World Bonus icon. That icon appearing on the second, third, and fourth reels will trigger a World Bonus. In this bonus, you will either be awarded the Drunken Clam, Chicken Fight, or Lois’ Hot Free Spins bonuses. 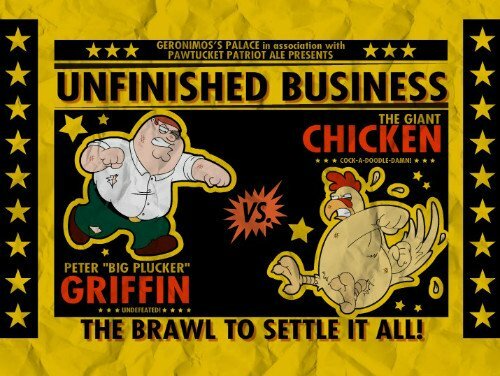 No Family Guy Game Would Be Complete Without Fighting Chickens. A Drunken Clam bonus round will see you able to pocket wins worth as much as 1,000x your total bet by selecting either Cleveland, Peter, Quagmire, and Joe. The Chicken Fight bonus see’s Peter take on his nemesis, with players pocketing wins for every round that the two characters fight. Lastly, Lois’ free spins bonus offers players plenty of sticky wilds as well as a Giggity Retriggerty feature which can add additional spins. Several randomly triggered features are present as we have mentioned. 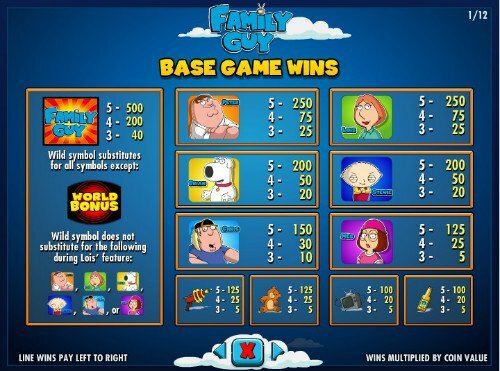 These Family Guy slot bonuses include Peter’s Feature (he farts multipliers worth as much as 5,000x your total bet on to the screen), and Stewie’s Feature (up to 3 wild reels can be triggered). Lois’ feature can offer you instant win prizes, whilst Brian’s Feature can see you trigger the World Bonus easier. Are you a family guy? If you happen to be the kind of gamer who loves special features - especially randomly triggered ones - Family Guy could be for you. There are many quality aspects to the Family Game game, and this has put it at least on par with rival NetEnt’s South Park slot, which is designed in a similar mould. IGT have done a stellar job with this game, making it enjoyable even to players who aren’t necessarily fans of the show.